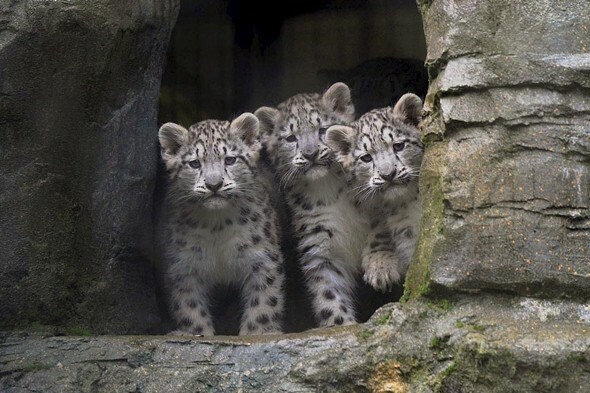 Three gorgeous snow leopard cubs have been unveiled at Marwell Wildlife, near Winchester, Hampshire. The cubs have been kept inside their den with mum Irina since birth and today was the first time they ventured outside to explore their environment. Now they're 12 weeks old and fully vaccinated, it's safe for them to take their first steps outside. And they loved every minute of it 'climbing rocks, play fighting and chasing mum', according the zoo. 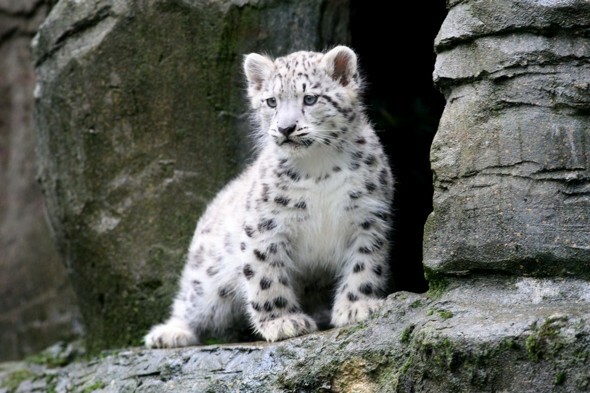 Snow leopards, like all big cat species, are threatened in the wild. This means that maintaining a healthy captive population of snow leopards is of vital importance to the global conservation strategy for the species. For a number of years, Marwell Wildlife has been part of the European endangered species breeding programme for snow leopards. Two of the cubs have been called Kamala and Kitana, but as of 25 August, the public are now invited to help the animal keepers name the last male cub. Visit marwell.org.uk to add your suggestion, and to book tickets for a visit to see them. The outdoor scenes of the Harry Potter films were shot in the grounds of Alnwick Castle, and it makes a great day out for Potter fans of all ages. The 1000 year old castle is home to the Duchess of Northumberland and her family, but it’s open to the public from April to October. A family ticket costs £34.20, and for that you can visit the State Rooms, Castle Courtyard, Museums and Grounds, as well as dressing up as a medieval knight for Knight’s Quest and the opportunity to enter the Dragon’s Lair. Harry Potter fans will enjoy broomstick training, falconry and a Hogwartian party and you can also visit one of the largest treehouses in Europe, which can be accessed via suspended walkways and rope bridges. You won't be disappointed if you take the kids for a day out at At-Bristol: it’s one of the UK’s leading science and discovery centres and you’ll have access to more than 300 interactive, hands-on exhibits - so it's worth every penny. A family ticket costs £37.60 and this allows you to come and go all day. Exhibits include a walk-through tornado, a TV studio, an exhibition about the human body including a real human brain, and an animation exhibition in collaboration with Aardman Animations. If the weather is fine there are lots of outdoor spaces that are perfect for picnics, so you won’t need to spend a fortune on lunch. There are nine WWT Wetland Centres across the UK and all of them offer something different, from interactive exhibits to canoe and bike safaris, discovery trails and educational play areas. You can experience the best of British wildlife on a wetland walk, talk or safari, where you might spot water voles, hares and dragonflies - or even a ‘bat walk’ in London. With centres in Slimbridge (Gloucestershire), Martin Mere (Lancashire), Welney (Norfolk), Llanelli (Camarthenshire, Wales), Caerlaverock (Dumfriesshire, Scotland), London, Arundel (West Sussex), Washington (Tyne & Wear) and Castle Espie (County Down, Northern Ireland) there’s bound to be one near you - and many activities are absolutely free. Fans of Fantastic Mr Fox, Charlie and the Chocolate Factory and James and the Giant Peach will enjoy a visit to Great Missenden, Roald Dahl’s home town. The Roald Dahl Trail takes you all round the surrounding area, including the woods, hills and farmyard that inspired some of his most famous tales. Download the trail for free and plan a day that could include the Angling Spring Wood Talking Trail, a run around Waddeston Manor’s Woodland Playground and a trip to the village of Turville. You could pretend that you’re the BFG and take a trip to Bekonscot Model Village, which costs £27 for a family ticket, or pay a visit to the Roald Dahl Museum and Story Centre, which costs £21 for a family ticket. Whether your children are old enough to ride their own bikes or need to use a child seat or trailer, a family bike ride is great way to have a fun day out without spending too much money. Sustrans recently launched a ‘Free Range Kids’ campaign to get kids out and about, and have a list of family friendly routes all around the UK, complete with suggestions about museum visits, where to eat and what to see. If you live in the north, you could take the three-mile route along Harland Way from Wetherby to Spofforth, taking in the medieval centre and castle on the way. If you’re in the south west, take the 5.5 mile route from Exeter South to Turk Lock, taking in the Exe Estuary and the wildlife reserve. It’s completely free to enter the Museum of Science and Industry (MOSI) and with collections ranging from early textile machinery and modern X-ray equipment plus galleries packed with cameras, aircraft and local history, there’s plenty to keep everyone amused. You can even take a walk through a Victorian sewer! It’s a great educational day out - and it’s fun, too. The Royal Air Force Museum in Cosford houses 70 aircraft and is home to war planes, missiles, transport and training and research and development collections. It’s a great day out for aircraft enthusiasts who will love the opportunity to see some of the world’s most impressive planes close up. There are special events throughout the year, including flight simulators and investigation trails - and admission won’t cost you a penny. If your little ones love trains, then the National Railway Museum is a great place for them to let off some steam. There are 100 locomotives under one roof - and the highlight is the Hogwarts Express, the train used in the Harry Potter films. The record-breaking engine Mallard is also on display and there are Explainers on hand to tell you all all kinds of interesting facts. You can also enjoy steam rides, an action-packed science show and a playground - and admission is completely free.